The Mineralogical Society of America sponsored a short courses in conjunction with their annual meetings with the Geological Society of America, and this volume represents the proceedings of the eighteenth in the sequence. This TEM course was convened October 23-25, 1992, at Hueston Woods State Park, College Comer, Ohio. The transmission electron microscope (TEM) has become an integral part of much current mineralogical research. It combines many of the functions of standard mineralogical instruments such as (a) the petrographic microscope for optical and textural studies, (b) x-ray diffractometer for structural data, (c) electron microprobe analyzer for determining chemical composition, as well as (d) several other spectroscopic instruments and techniques for more specialized measurements. This blend of capabilities in a single instrument, permitting multiple types of measurements on the same mineral grain, allows unique insights to be obtained. Moreover, each of these observations can be made on a finer scale than is possible by any other technique. The utility of the TEM as a mineralogical, petrographic, and geochemical tool is obvious. While extremely powerful, it is not surprising that electron microscopy is also complex. 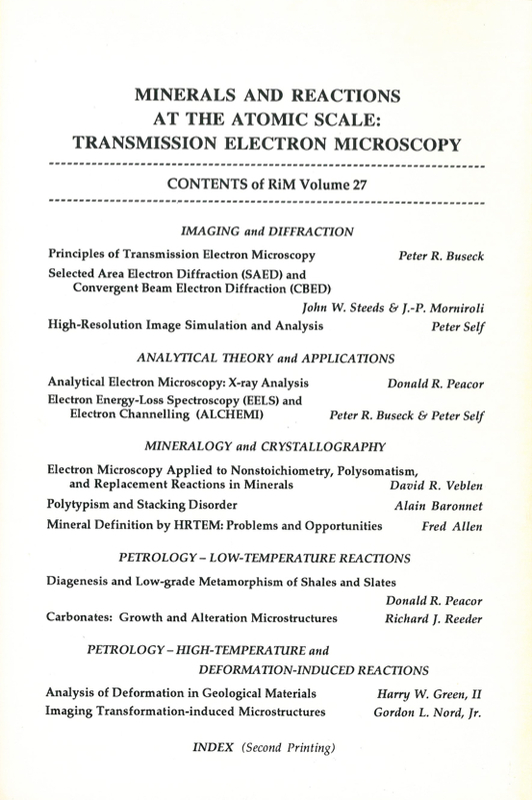 A familiarity with the instruments mentioned in the previous paragraph is desirable for utilizing the TEM and interpreting the data arising from it, but there are also features that are unique to electron microscopy that this short course and volume attempt to impart. Clearly, a short course would be impractical if our goal was to become thorough experts, knowledgeable in all aspects of theory and practice of electron microscopy. Fortunately, however, such expertise is not required. Modem TEMs are quite "user friendly," with many functions handled by tame, dedicated computers. Thus, an operator with modest knowledge and skills can obtain useful information using modem TEMs. At the same time, the range and quality of information obtained increases in direct proportion to the experience of the TEM operator. The purposes of this short course are to provide a background to the TEM as a mineralogical tool, to give an introduction to the principles underlying its operation, and to explore mineralogical applications and ways in which electron microscopy can augment our knowledge of mineral structures, chemistry, and origin. Much time will be devoted to mineralogical applications. If successful, the short course will provide sufficient information to allow mineralogists and petrologists to have an informed understanding of the data produced by transmission electron microscopy and to have enough knowledge and experience to undertake initial studies on their own. 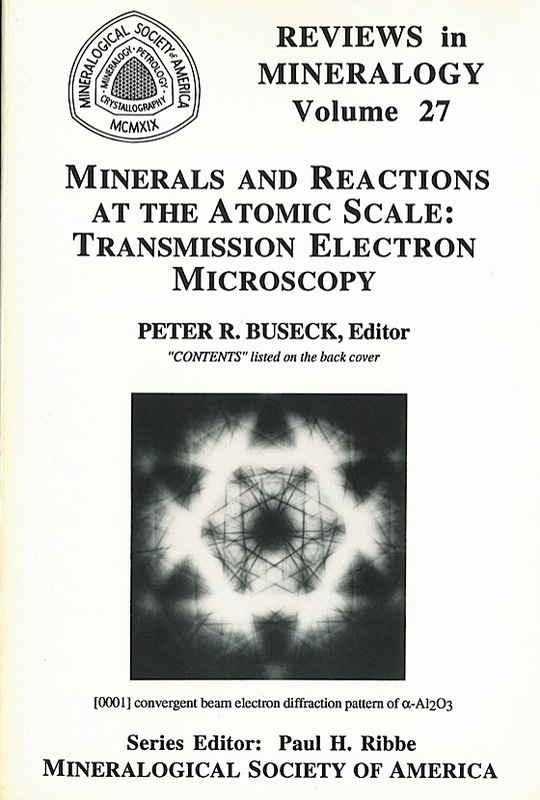 The opening chapters cover the principles of electron microscopy (Chapters 1, 2, and 3) and chemical analysis using the TEM (Chapters 4 and 5); the next seven chapters consider mineralogical, petrological, and geochemical applications and their implications, for both low- and high-temperature geological environments. Chapter I introduces the TEM and provides a background for its use, including a survey of both theory and practice. Electron diffraction and its uses for understanding symmetry and structures are given in Chapter 2, while a more detailed understanding of the physics of the TEM and its imaging abilities are covered in Chapter 3. Taken together, these chapters summarize much of the theory of imaging and diffraction by electron microscopy. Chapters 4 and 5 consider chemical analysis on a micro-scale using emitted xrays and transmitted electrons, respectively. The remaining chapters detail specific geological applications, including the new types of mineralogical information that have been obtained through electron microscopy. Chapter 6 details the mechanisms of certain metamorphic reactions and mineralogical complexities, while the question of the rich variety of ways that layered minerals can be organized are considered in Chapter 7. The high resolutions afforded by the TEM have caused new questions to be raised, such as those relating to the definition of mineral species and phases, and these questions are explored in Chapter 8. Reactions and processes occurring at low temperatures in sedimentary rocks are considered in two chapters: Chapter 9 on diagenetic processes and their effects on clays and shales, and Chapter 10 on carbonate microstructures. The effects of pressure and tectonic processes are discussed in Chapter 11, and the effects of transformations at elevated temperatures are explored in Chapter 12. These last two chapters emphasize what is commonly called "amplitude contrast" or "conventional" microscopy; some of the earlier ones utilize "phase contrast" and "high resolution" microscopy. Most of the mineralogical studies actually utilize several complementary techniques; it is important to realize that the TEM is only one of many powerful instruments available today for the study of mineralogical problems.